A large part of the Lost & Found Fungi (LAFF) project involves aiding our volunteer collectors in their mycological education. A field week in Cornwall therefore involves much more than simply keeping our eyes peeled for rarely recorded fungi! In many ways we could not have picked a worse week for a field trip; with the ‘beast from the east’ providing less than ideal conditions for field collection and cutting our planned 2-day microscope workshop in half. However, despite such adverse weather, finds of #LAFF100 target species Favolaschia colcera, Xylaria crozonensis, & Hypoxylon fuscoides (yet to be confirmed) along with returning the great input of the Cornwall Fungus Group with three days of forays and a single day of microscope and identification training, meant the week was a success. We were extremely thankful to local fungal enthusiast and ringleader of the Cornwall Fungus Group, Pauline Pena for organising local logistics, as well as her mycological knowledge. Pauline guided us to great local sites, Illogan Woods, Perranzabuloe, Allet Bog, Ventongimps Moor, Breney Common, for three days of foraying. We cut short the planned microscope workshop due to the snow but still managed a single day focusing on microscope techniques, slide preparation, and identification of the collected fungi; a diverse range of taxa. A second visit may well be necessary to make up for the lost day and thank the Cornwall group for their numerous records of our target rarely recorded fungi. First, collections: many common species were evident such as this Auricularia species. As well as common species, our keen eyes also spotted more rarely recorded species. 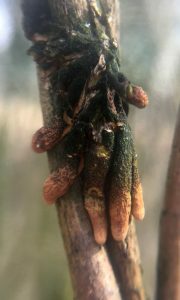 Hazel gloves, and closely related willow gloves, are thought to parasitise glue crusts, which in turn parasitise their plant hosts. Mature hazel gloves are certainly worth a photograph! LAFF project leader, Brian Douglas inspects a chewing-gum-like growth on this fallen branch. The chewing-gum-like growth is in fact a fungus; #LAFF100 species Xylaria crozonensis. Here we see #LAFF100 target species, the ‘Orange Porecap’ fungus, Favolaschia calocera. ….in this instance none of the fungus was found. We are also interested in poo fungus! Cheilymenia coprinaria, Saccobolus truncatus, Schizothecium conicum, and Schizothecium hispidulum were all identified on this frozen pile by Kew’s Paul Cannon. Now onto the microscope workshop: participants, equipment, and numerous collected samples for inspection. A great setup of dissecting microscope, compund microscope, and computer. Local collectors discussing mycology collecting and identification. All images by O. Ellingham unless otherwise stated. This entry was posted in Public Engagement with Science and tagged #LAFF100, Cornwall, Foray, Fungi, Kew, LAFF, Mycology, The Lost & Found Fungi Project, UK Fungus Foray, Workshop. Bookmark the permalink.